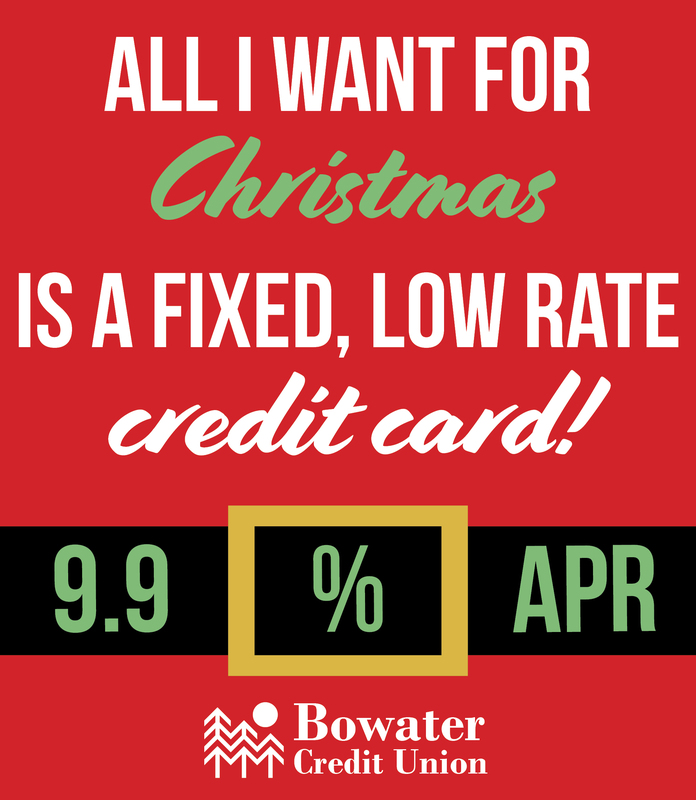 All I Want for Christmas is a Fixed, Low Rate Credit Card! Are you carrying a balance on your credit card? Get the Bowater Credit Union Classic Visa in your wallet. Your credit union’s credit card offers a fixed rate of 9.9% APR, no matter your credit score – compare that to the nationwide average of 17.14 percent as of November 15, 2018 (creditcards.com). That can mean a difference of hundreds of dollars saved as you pay off your balance. There’s never a balance transfer fee with the Bowater Credit Union Classic Visa, so you won’t have to worry about whether or not the move will actually save you money – if your rate is higher than 9.9% APR, it will save you money to switch. Credit Card offers can be confusing. Introductory rates, penalty rates, fees and more: the Bowater Credit Union Classic Visa keeps it simple. There’s no introductory rate. There’s no penalty rate. Just a great card, with no over-the-limit fees and a low late fee. So you can shop with security and confidence and know that if you are carrying a balance, you are paying a fair rate of interest. Payments of $21.20 per $1000 borrowed for five years. Minimum payment of $20.